The term chronic “myelomonocytic” leukemia (CMML) indicates that all cells of the myeloid lineage are involved (myelo-), but emphasizes the prominence of monocytoid features (“-mono-”). The hallmarks of CMML are peripheral monocytosis >1, 000/μl, with <20% bone marrow blasts and the presence of bone marrowdysplasia.CMML shares clinical and biological features with both myelodysplastic syndromes (MDS) and chronic myeloproliferative diseases (CMPDs), and may take on predominantly myelodysplastic (MD-CMML) or myelprolifearative (MP-CMML) characteristics (e.g., Ref. ). There is a dynamic evolution through increasing monocyte counts in approximately one-third of patients (see Fig. 7.1). 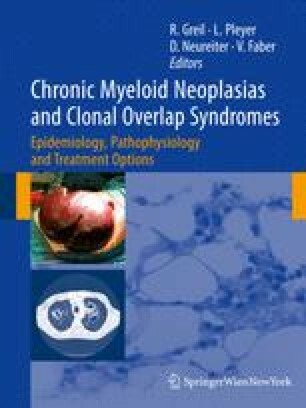 MDSRA patients may develop peripheral monocytosis during the course of their disease and ultimately progress to CMML . Approximately one-fifth of patients with MDS present with a monocyte count of above 10% in the peripheral blood without fulfilling the FAB/WHO criteria for the diagnosis of CMML. A high incidence of disease progression to CMML has been reported for this subgroup  (see Fig. 7.1).